What is a Porcupine Fish?Porcupine fish are fish of the family Diodontidae. Porcupine Fish can inflate their body by swallowing water or air and become round; their size can double. Inflating is a defense against predators (other animals that would like to eat them). A second defense are the sharp spines that cover its body, especially when they are inflated. 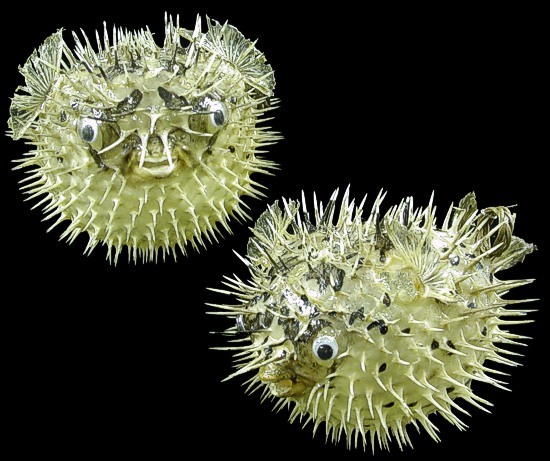 Some Porcupine Fish are poisonous. These defenses cause the Porcupine Fish to have few predators. Predators are the shark, orcas (killer whales) and some species of dolphins. Porcupine Fish Habitat. 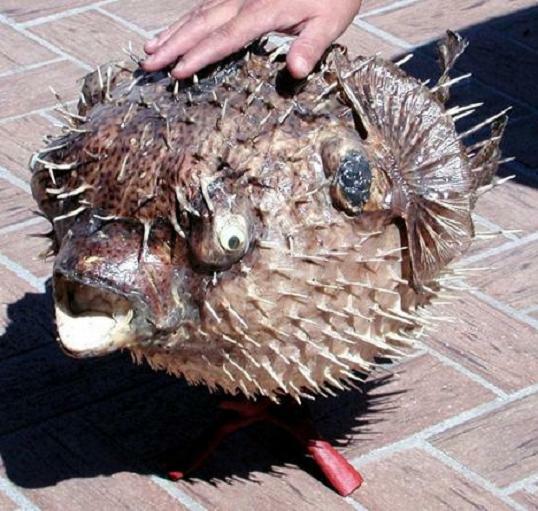 Porcupine Fish have been seen world wide. Its favorite place is near coral reefs. Porcupine Fish range in size from 3 inches to more than 19 inches. These fish are night feeders (nocturnal). Listing Picture. The picture is an excellent portrait of the Porcupine Fish. You can see its spines and round feature when inflated. Our Porcupine Fish are completely natural except for the eyes. They come with an attached fish line and lop for hanging or you can snip the line and mount the fish as you please. They range from golf ball to basketball in size.